These intricately knitted, lace-patterned gloves are bursting with enough color to brighten up any day. The colors range from light pink to bright red to light blue to royal blue to green. The lace pattern looks like fish scales on the front, whereas the underside of the gloves is knit in a very cool broken-ribbed pattern, lending fun texture to both sides of the gloves. These are a longer style glove than the roll-tops. They can be washed in the machine. Size: Approx. 8.5” long, 9” circumf. Care instructions: Machine wash warm on delicate. Tumble dry low heat. Or, lay flat to dry. I hand knit these gloves them using double-pointed needles, so they have no annoying seams. I used a yarn which is 75% virgin wool and 25% nylon. 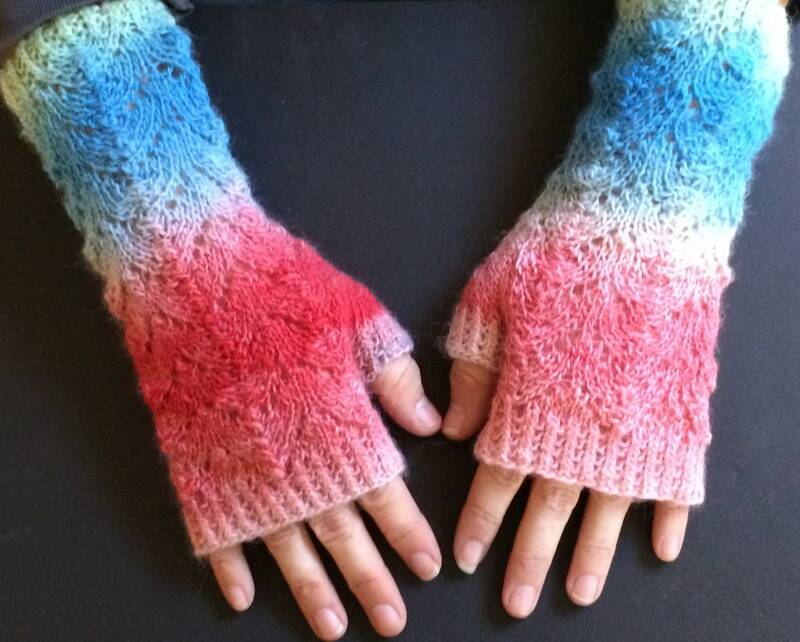 Keep your fingers free to work, craft, and write, while keeping your hands warm. You’ll feel like you’re living in Dickensian England when wearing these!